The Montana Western basketball team present their NAIA Championship trophy after beating Oklahoma City 75-59 March 19. Anderson was one of only five athletes to receive the recognition out of 32 other teams. She started all five games of the championship tournament, finishing with 16 points, two assists and two steals in the title game. The former Rigby standout started all 34 games during the title season on the way to helping the team win its first women’s basketball title in Montana Western School history. In the first game of the tournament against Georgetown (Ky.) , Anderson finished with 20 points, followed by 10 points against Lyon (Ark. ), six against The Master’s (Calif.) and five against Freed Hardman. The Bulldogs led by double-digits for a majority of the game leading by as many as 23 points in the fourth quarter. Anderson gave UMW its first lead of the game at 7-6 with a three-pointer with less than seven minutes remaining in the first quarter. She would add another three-pointer shortly after giving the Bulldogs a 13-8 lead. 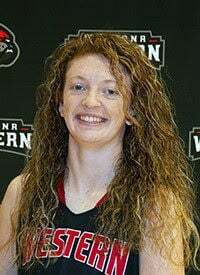 Tori’s father Steve said despite being named to the NAIA All-Tournament First Team, he is most proud of her 4.0 grade point average and being named one of three Scholar Athletes from Montana Western. Anderson has one semester remaining before she graduates with a degree in Health and Human Performance. During the semester she said she plans to be an assistant coach for the team, a career path that she said she may consider in the future. She also said she would consider coaching softball or become a physical therapist or athletic trainer. After graduating from Rigby High School in 2015, Anderson played two-years of basketball at the College of Southern Idaho, before being recruited by Western Montana to finish out her college basketball career. Tori is the daughter of Steve and Brooke Anderson.